Theresa is one of the few women who have been proclaimed a doctor of the Church. Living at the time of the Reformation, and sometimes not without suspicion and opposition from the Church, she reformed her own order the Carmelites, which became known as discalced Carmelites. She was born Teresa de Cepeda y Ahumada in 1515, at a time when Luther was beginning to understand for the first time in his life what was meant by Paul's teaching in Romans of being made righteous by God. That enlightenment was to spark off his challenging some of the doctrines of the Roman Church, including the selling of indulgences in 1519. Whilst Luther was involved in his clash with the Church, Teresa was enjoying her childhood. There are glimpses of some of the character of the mature Teresa in her childhood years, evident in her description of wanting to be a martyr. My brother and I used to read the Lives of the Saints together. When I read of martyrdom undergone by the Saints for the love of God, it struck me that the vision of God was very cheaply purchased. ... I used to discuss with my brother how we could become martyrs. We settled to go together to the country of the Moors, begging our way for the love of God, that we might be there beheaded; and our Lord, I believe, had given us courage enough, even at so tender an age, if we could have found the means to proceed; but our greatest difficulty seemed to be our father and mother. At twenty years old she joined the Carmelite Convent of the Incarnation at Avila. Previous to that she had been educated by Augustinian nuns after her mother's death. Those early years were mainly ones of distractions and vanity, which of course like Augustine she lamented in later life. how little I am worth. on the way of wickedness. Life 21. So her first years in the convent were not of any note in piety, but they were disjointed by a severe illness, which left her legs paralysed for three years. In Lent 1554 Teresa underwent a deep conversion when she experienced a vision of "the sorely wounded Christ" which changed her life forever. After that she experienced many visions of Christ and her life focused more and more on the passion of our blessed Lord. In this critical period of her life she was enormously helped by St. Peter of Alcantara who counselled her: "Keep on as you are doing, daughter; we all suffer such trials." He would stand by Teresa as she struggled to have her new order recognised in Rome and Spain, and especially by her own townspeople and even members of her own community. Teresa received apostolic permission, dated 7th February, 1562 for the new foundation of the new convent. Six months later on St. Bartholomew's day the new monastery dedicated to S. Jose was blessed by Maestro Daza, the bishop's delegate. Four novices received the habit of the Discalced Carmelites. Soon afterwards she received permission from the Carmelite General to found more houses, including two for men. One of those involved in the formation of a men's house was John of the Cross in 1568 at Dureulo. He became a great strength to Teresa especially when the Carmelite General appointed her prioress of her old convent of the Incarnation. Here John became the sisters' confessor. By the time of her death there were 16 foundations at: Medina del Campo in 1567, Malagon in 1568, Valladolid (Rio de Olinos) in 1568, Toledo in 1569, Pastrana in 1569, Salamanca in 1570, Alba de Tormes in 1571, Salamanca in 1573, Seville in 1575, Caravaca in 1576, Seville in 1576, Palencia in 1581, Sonia in 1581 and Granada in 1582. The two men foundations were at Duruelo in 1568 and Pastrana in 1569. Teresa was a gifted teacher, and under obedience, that is, at the command of her confessors wrote various works for her sisters in order to assist them to live more holy lives in union with their dear Saviour. Her three best known writings are The Inner Castle, The Way of Perfection and her own autobiography. 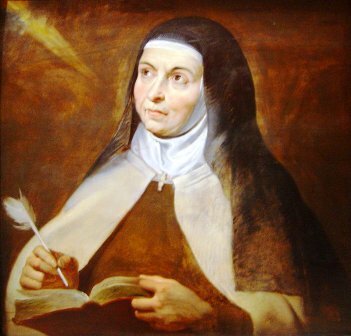 Although Teresa wrote predominately having her own sisters in mind, her writings are such they have surpassed her own time, and have helped many Christians even into the 21st century to understand the meaning and purpose of prayer. Why does one pray? We pray "to receive strength to serve the Lord" and to "produce good works" (Castle 7.4). We also pray to enter into a living relationship with Christ Himself. Reminiscent of St. Augustine, Teresa confessed God "waited so long for me" to be in love with Him. tell me, why do I hesitate? And why do you delay? and being immersed in that love to love again? in the place that is most fitting. For Teresa prayer is thus a loving relation between the soul and God. That relationship develops into real friendship, which she experienced in her own life. The soul learns it is not so much of saying or doing but being, being conscious of the Divine presence in one's life. As she says in Life 8, "Mental prayer is for me none other than an intimate relation of friendship, frequently spending time alone with the one whose love for us is beyond doubt." However to practise silent prayer in loving contemplation of one's lord, the soul has to shed its own self-awareness and selfishness. It is only then that the soul is free to love completely. This extract from The Interior Castle reveals this. In this writing she this work Teresa describes the journey of the Christian who is seeking union with the Beloved. In making that journey the Christian has to pass through seven mansions before reaching the centre of the castle where the Beloved lives. One of the images Teresa used to manifest this union is that of a silk worm. Just as the worm has to die to become a beautiful butterfly, so the self has to die in order to become the new person in Christ. When it is full-grown, then, [the worm] starts to spin its silk and to build the house in which it is to die. This house may be understood here to mean Christ. Let the silkworm die let it die, as in fact it does when it has completed the work which it was created to do. Then we shall see God and shall ourselves be as completely hidden in His greatness as is this little worm in its cocoon. To see, then, the restlessness of this little butterfly -- though it has never been quieter or more at rest in its life! Here is something to praise God for-- namely, that it knows not where to settle and make its abode. By comparison with the abode it has had, everything it sees on earth leaves it dissatisfied, especially when God has again and again given it this wine which almost every time has brought it some new blessing. It sets no store by the things it did when it was a worm -- that is, by its gradual weaving of the cocoon. It has wings now: how can it be content to crawl along slowly when it is able to fly? All that it can do for God seems to it slight by comparison with its desires. It is not surprising, then, that, as this little butterfly feels a stranger to things of the earth, it should be seeking a new resting-place. But where will the poor little creature go? The silkworm has of necessity to die; and it is this which will cost you most; for death comes more easily when one can see oneself living a new life, whereas our duty now is to continue living this present life, and yet to die of our own free will. I confess to you that we shall find this much harder, but it is of the greatest value and the reward will be greater too if you gain the victory. But you must not doubt the possibility of this true union with the will of God. This is the union which I have desired all my life; it is for this that I continually beseech Our Lord; it is this which is the most genuine and the safest. Obviously hand in hand with becoming "a butterfly" is obedience. Once the soul has resolved "to love you and to deliver itself into your hands", the soul "has no need to seek paths and choose between them, since from now on its will is yours. It is you my Lord who undertakes to be its guide" (Foundations 5). At a time when it was dangerous for anyone, especially a woman to advocate knowledge of the Scriptures, Teresa did. "Lord Jesus, if we could only know all the passages in Scripture which describes the peace of the soul!" she exclaimed. Indeed she so much wanted all Christians to desire to know all the secrets of Holy Scripture. However with the Inquisition breathing down her neck, having books on the Scriptures in her library was dangerous, very dangerous until her Lord appeared to her reassuringly, "Do not be afraid, I will give you a living book" (Life 26). There is no doubt that for Teresa the spiritual life had to conform to Scripture, which she believed hers did. However for Teresa sin amor, todo es nada. Love is the essence of all life in Christ. It is this that enables one to reach out to others as well as joining the soul to Christ in all aspects of His life. Christ indeed has no other hands and feet than ours. After founding her last convent at Burgos, in 1582, St. Teresa returned in very poor health to Avila. The difficult journey proved to have been too much for her frail condition. She took to her deathbed upon her arrival at the convent and died three days later on October 4, 1582. The next day the Gregorian Calendar went into effect, thus dropping ten days and making her death on October 14. Teresa was canonized in 1662 by Pope Gregory XV and was declared doctor of the Church, the first woman so honoured, in 1970 by Pope Paul VI. Her feast day is the 15th October. On this day we give thanks to God for the wisdom and energy of this remarkable woman and for her teachings on prayer and spiritual growth. ST. TERESA OF AVILA 1515-1582.
and you never cease to love those who love you! Lord of the universe. Life, 25.
how strong your love is! anything other than you. Life, 14.